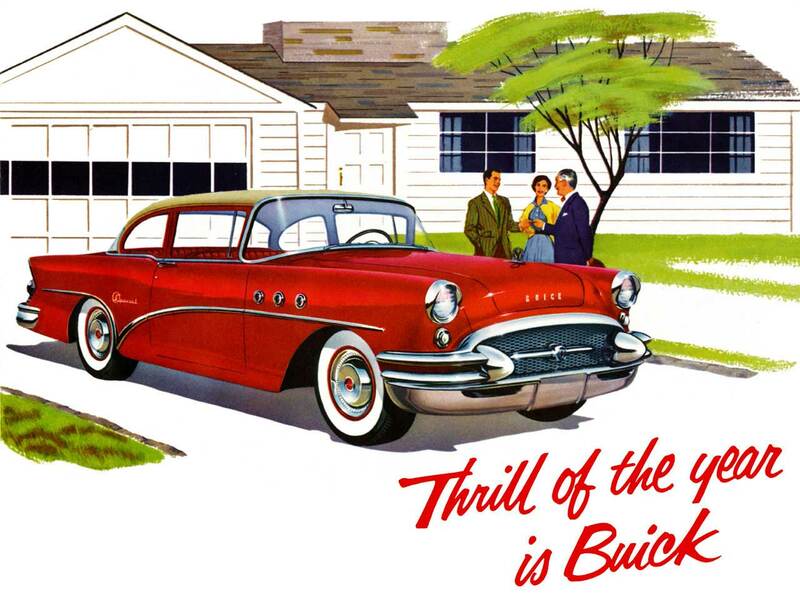 The content of this page reflects the 1955 Buick Air Conditioner brochure. It cools down a hot car quickly-keeps it cool, even in slow-moving traffic-continually replenishes the atmosphere inside the car with a fresh supply of filtered outside air -lets you ride in clean, quiet comfort with windows closed on dusty, windy, and rainy days, even when cooling is not needed. Start the Cooling System by turning the Temperature Control Knob (2) to the right as far as you wish. Close Windows, Door Vent Panes, and all Dash Ventilation Dampers. NOTE: If your car has been standing in the sun with windows closed, open windows for a moment to let hot air escape. Adjust Temperature Control (2), turning the knob slightly left or right until you locate the thermostat setting that suits your comfort. Adjust Fan Speed (1), turning the switch indicator to “Fast” or “Slow” if high speed is not needed. Adjust Outlet Directors (3), turning the cup-shaped vents to direct incoming conditioned air whichever way you find most comfortable-towards the roof, alongside the windows, or down towards the floor. Leave Cooling System Closed, with Temperature Control (2) turned off to the left. Turn Fan Speed Switch (1) to “Fast” or “Slow” to suit your comfort. Close Windows and Door Vent Panes. 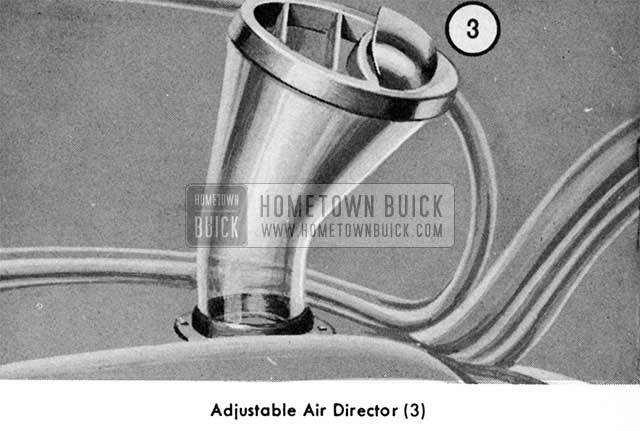 The Circulation System will then ventilate the car with a continual flow of freshly filtered air drawn in through your 1955 Buick Air Conditioner’s outside air intakes-while closed windows shut out dust, wind roar, pollen and rain. Save fuel and wear on the working parts of your Airconditioner – by keeping the Temperature Control Knob turned off, all the way to your left. 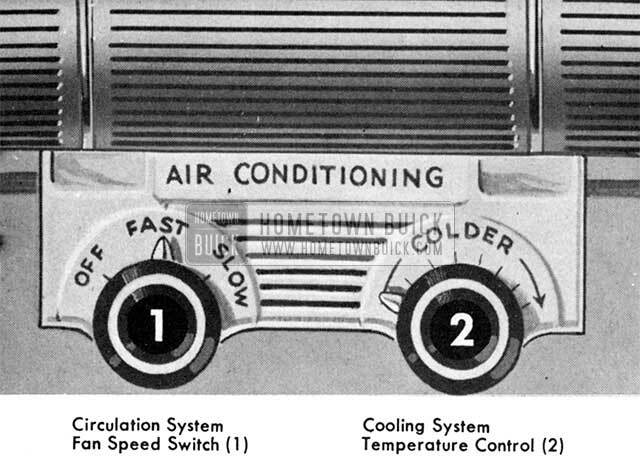 At this “Off” setting, the 1955 Buick Air Conditioner clutch is automatically disengaged. When cooling is again needed, simply turn the Temperature Control Knob. 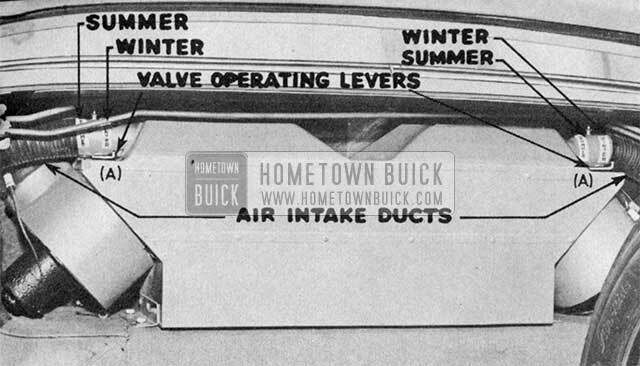 To keep cold winter air from coming into your car through the Rear Deck Air Intakes and up through the 1955 Buick Air Conditioner ducts – simply reach into the luggage compartment and close Air Intake Valves (A) as pictured at left and right above. When warm weather returns, remember to reopen these Air Intake Valves – otherwise your Airconditioner, cut off from its normal supply of outside air, cannot operate with full efficiency. 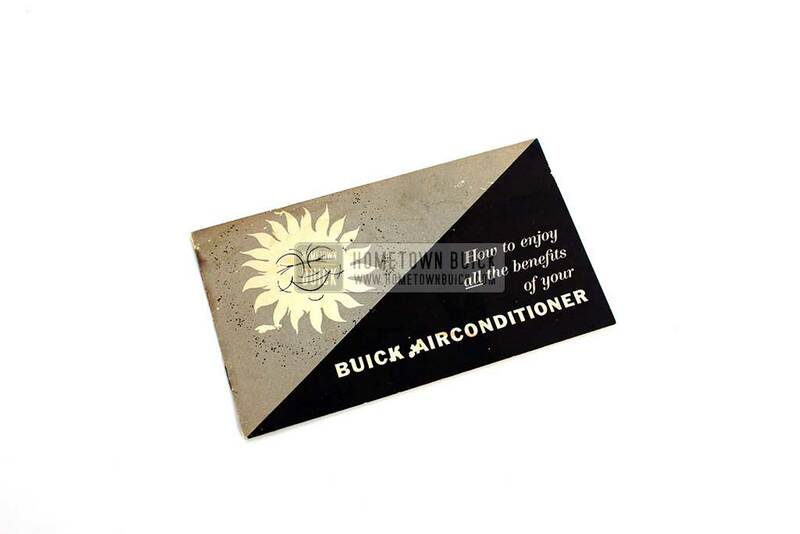 NOTE: Your 1955 Buick Airconditioner normally needs no servicing, other than the above valve adjustment, during its lifetime. The refrigerating unit requires no defrosting or refilling, and the sealed mechanism is self-lubricating.